This is for everyone I met doing the Whole Foods demo this afternoon. I hope you enjoyed this dish. As promised, here is the recipe. Okay, so even if you don’t like fish, you will like this. When you pan-sear fish, it keeps it very moist and tasty on the inside, while making it beautifully crispy on the outside. The ginger adds a perfect amount of flavor, and the Asian Sesame Dressing? Uhm…I could drink it! You can pan-sear any firm white fish. I use whatever is on sale. My favorites are cod, grouper, tilapia, or even halibut. Salmon, as pictured above, would be a great choice too. I serve this with an easy green side salad topped with carrots and red peppers. This is a beautiful dish, and all the savory goodness comes from the spices and the dressing. It is low in calories, but high in flavor. Combine flour and spices in a flat dish. Heat oil and butter in large skillet. 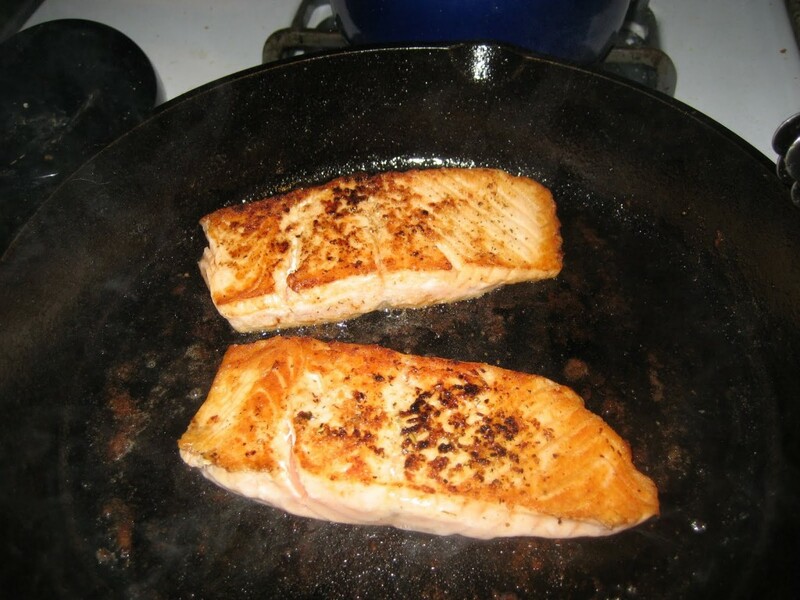 Put fish into pan and cook for about 2 minutes on each side or until cooked. Serve with a side salad and spoon dressing over fish and serve. Find the Asian Sesame Dressing Recipe HERE. I don’t see where the Asian Sesame Dressing gets involved.